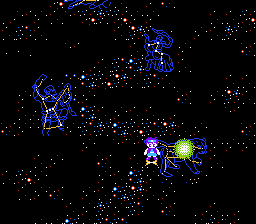 Palamedes II: Star Twinkles is a puzzle game for the Nintendo Entertainment System. 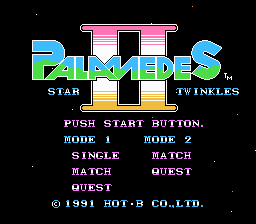 Palamedes II is a puzzle game and, as it sounds, the sequel to an obscure NES puzzler. 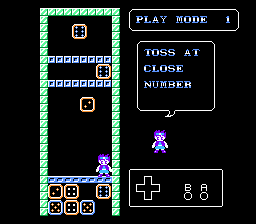 The object is to throw one of the player’s dice at a die with the same number or one away. When you clear a die, it is added to the player’s poker-like “hand” and the bottom of the screen. When you’ve got a winning hand, you can use it clear multiple lines at once. 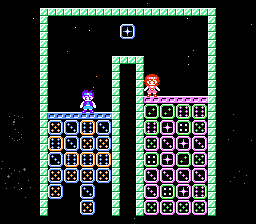 The game has two modes: Mode 1 is a survival mode and Mode 2 is a screen-clear mode. 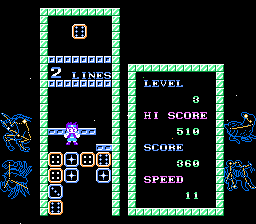 This patch only translates the intro, but it looks like that is probably the only Japanese text in the game.